The technique of linocut printmaking was first developed by Professor Franz Cizik of Vienna in the 1880s, but because it was mainly used as a simple and inexpensive way of teaching children to make prints it was largely disregarded by established professional artists. It was not until many years later that the full potential of the linocut was recognised and some of the great modern artists of the day began to produce them. Artists such as Munter, Heckel and Rohlfs, Kandinsky and Rodchencko as well as Matisse and Picasso made linocuts. However, the real surge of interest in linocuts in Britain came from the teaching and enthusiasm of the artist Claude Flight who had attended the progressive Heatherley's Art School together with CR Nevinson. They were both impressed by the mechanical age imagery and energy of the Italian Futurists who had exhibited in London in 1912. Later, in the twenties, Flight was inspired by an exhibition by Cizik's pupils, although his own work did not reflect this influence until many years later. But it sparked off an enthusiasm for the medium and eventually a long period of dedicated teaching of the subject. In 1925 Flight helped Iain McNab to set up the Grosvenor Art School in London. They were joined by Cyril Edward Power and his close colleague and collaborator Sybil Andrews. Power was an established architect who had worked in private practice and lectured on Architectural Design and History at University College, London; author and illustrator of a 3-volume work History of English Medieval Architecture. He was a fellow of the Royal Historical Society and had also produced and exhibited watercolours and drypoints. At the Grosvenor School he taught a range of architectural subjects. Frank Rutter taught Modern Painters and Claude Flight influenced a whole generation of artists through his classes on linocut printmaking. Power and Andrews attended these classes together alongside international students. Very soon they became deeply engrossed in the potential and development of the technique and they played a prominent part in the subsequent annual exhibitions of the Grosvenor Art School. One result of these exhibitions was an important commission by the London Underground Electric Railway for a series of posters linking the sporting events with nearby tube stations, and later buses and coach hires - Southfield Station for Wimbledon Tennis, St. John's Wood and The Oval for cricket, skating at Wembley and racing at Epsom. The strong clean-cut design and clear colours were Art Deco in style but also echoed the positive modernist approach of the Italian Futurists earlier imagery. Gradually themes were expanded to boating, dancing, music, and of course the tube station was an enduring subject among others appropriate to the artist's rhythmic, flowing style and sense of movement. During recent years there has been a revival of interest in linocut printmaking and it is a popular medium amongst artists young and old. 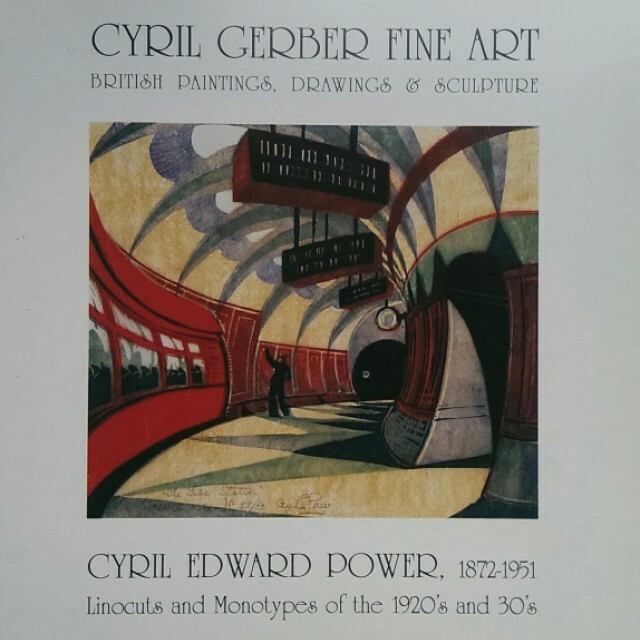 But the early works of Cyril Edward Power which have survived still stand as major examples, as alive and vibrant as they were in the twenties and thirties when they were first created. This exhibition includes a good cross section of these.